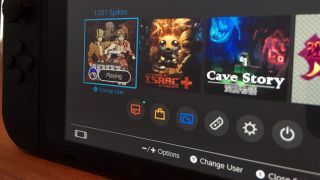 Nintendo has announced the file sizes for its Nintendo Switch software lineup and they make it clear that fans of digital downloading are going to have to expand their console’s memory. Just how big are these files? Well, Dragon Quest Heroes 1 and 2 is a 32GB download which is the exact amount of internal memory the Nintendo Switch has. Considering some of this will already be taken up by the console’s operating system and its pre-installed software, there’s no way you’d be able to digitally download the game without the addition of a microSD card. Dragon Quest Heroes fans in the UK and US won't find this an overly pressing issue as although the game is a confirmed launch title in Japan, its released date hasn't been confirmed anywhere else. Of course, this won’t be much of a problem if you’d rather purchase physical copies of all your games but this is an approach to game buying that’s increasingly not for everyone. It could always be worth buying the games with larger file sizes in cartridge form and packing out your internal memory with smaller downloaded titles to forego the need to purchase a card. Although more substantial games will have understandably larger files, there are still some games coming to the console that will have much smaller demands. Mario Kart 8 Deluxe is expected to come in at 7GB, and I Am Setsuna, Puyo Puyo Tetris and Snipperclips all come in at less than 2GB each. Fortunately, the console will support microSD, SDHC and SDXC cards all the way up to 2 TB in size (when cards of that size exist) so if you invest in a large card from the offset it’s unlikely you’ll find yourself with a memory card collection to rival your friend’s cartridge collection. The news that a microSD card will be an essential and even necessary purchase for downloaders isn’t all that surprising as we’ve known for a while now that The Legend of Zelda: Breath of the Wild is going to have a fairly large file size of 13.4GB. That said, though the news isn’t much of a surprise, the fact that Nintendo has essentially implemented a microSD tax for those who prefer to digitally download their games isn’t likely to be the most welcome news. Want to know what accessories you’ll need to make the most of your new Nintendo Switch? Here are our suggestions.